HEL/LO we talked about dreams! From left: Asif Khan, Hella Hernberg, Hanna Harris, Maw Dewndey, Chee Kit Lai and Olli Sirén. Photo: Aleksi Niemelä. We are back in Helsinki after spending two fantastic weeks with book launches in New York and London. Thanks to Finnish Institutes in both cities for organising interesting seminars and exhibitions. Grassroots innovations in Helsinki seem to be of interest abroad. Our list of retailers is growing: You can now find the book at MoMA PS1, Van Alen Books and Spoonbill&Sugartown in NYC, and at the AA Bookshop in London! And apart from that, we also have a distributer in Japan: Matkatori. Keep an eye on our list of retailers for future updates. We’ve been invited by the Finnish Institute in London to speak at HEL/LO Let’s Talk – a series of four events that will bring together architecture and design professionals from London and Helsinki for a lively discussion and exchange of ideas throughout the year. The first event to kick off the series 24 May is called HEL/LO – Let’s Talk About Dreams. Editor of Helsinki Beyond Dreams, Hella Hernberg, will join the discussion that focuses on self-initiated, DIY architecture and design projects that shape the cities and communities we live in. Have a look at Hella’s interview at the event’s pages. HEL/LO will also be the London launch for Helsinki Beyond Dreams and the book is for sale at the event. Yesterday we celebrated the Helsinki Beyond Dreams book launch together with Napa Illustrations’ new book: Yellow City. These two books have both been born at the L3 harbor warehouse in Helsinki’s developing Jätkäsaari area, and the warehouse’s empty halls were a great space for a launch party. Thanks everyone who participated! “Helsinki Beyond Dreams is a collection of articles in which dozens of active city residents share their views of more exciting, enjoyable and green neighbourhoods. 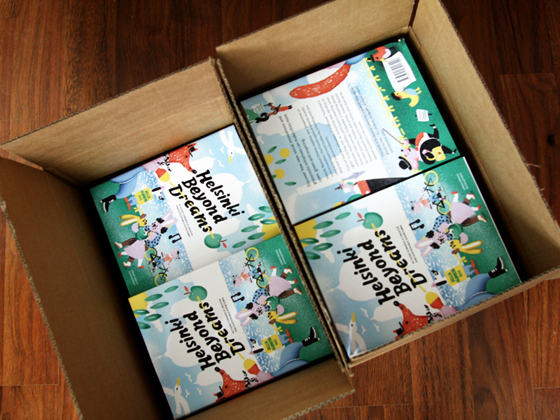 Helsinki Beyond Dreams is here! The pallets have landed safely at our warehouse. We’ll be soon ready to celebrate the book launch. Helsinki Beyond Dreams is a big step closer to coming true. The printing machines are singing. We took our bikes along on a ferry and visited the printing house across the bay. The first test print sheets travelled back home with us on the bike. The book printing and binding will go on and Helsinki Beyond Dreams will be out in mid-April. For the past year or so, we have been busy with our forthcoming book. Titled Helsinki Beyond Dreams, the book is about emerging local cultures and how they make a difference. We’ve invited a culturally varied group of urban activists, theorists and designers to share their views and stories around the new things and ideas that are making Helsinki a better place. We can’t wait to get all the inspiring stories and the rich photography out and published! Helsinki Beyond Dreams is a book about new urban culture and how it can make a difference. CHRISTMAS OFFER: 25% off until 20 December 2013!